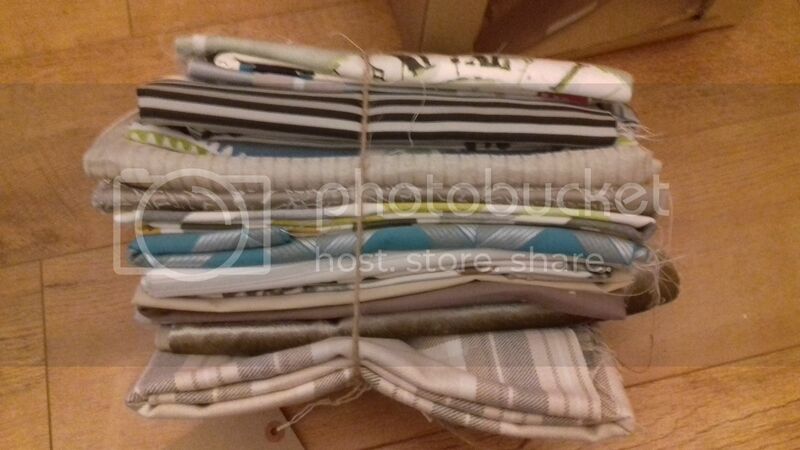 A month or so ago I was contacted by Becki at Interior Goods Direct who asked me if I'd like to sew some items using some fabric that they would send me. Of course, the answer was yes! This lovely bundle was what she sent me. They're all long quarter or half yard cuts and they are in a range of substrates. I've got cotton, canvas, linen, velvet, satin and a few others I can't really identify! I plan to bring you a series of posts about what I make with some of these fabrics. 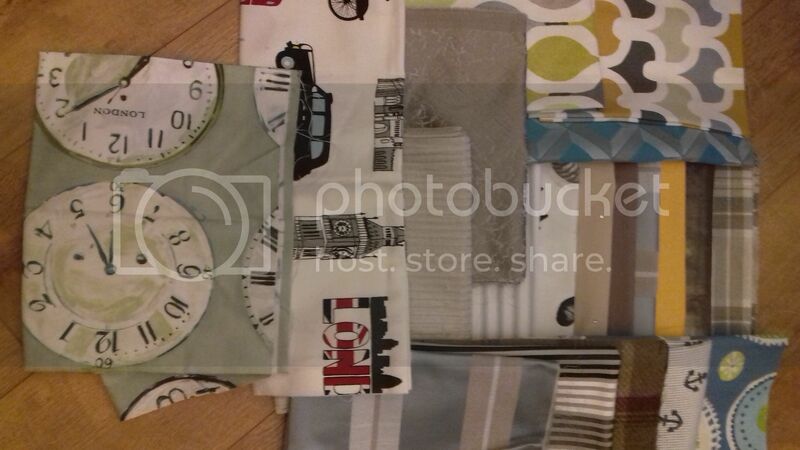 I love those clocks on the left and the two fabrics top and bottom right. There are also some great basic patterns in there in fabrics that will challenge my sewing skills! 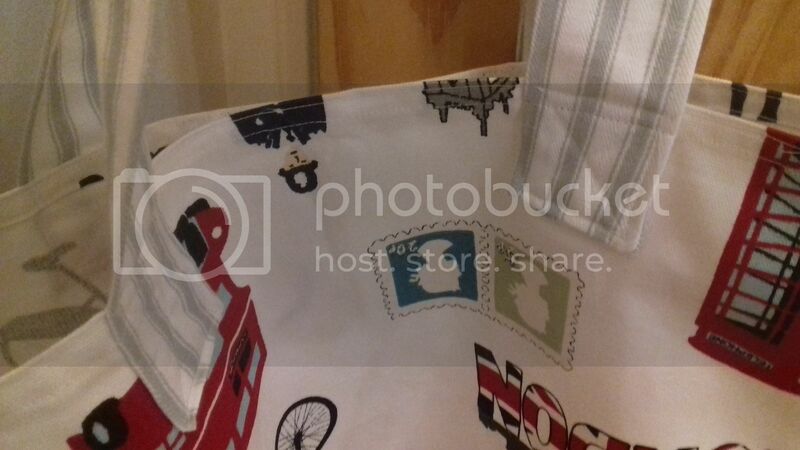 That London themed canvas shouted "shopping bag!" at me, so a shopping bag it was! I was left with just a small remnant, though I did use a striped ticking fabric from the bundle on the handles. I had to piece them whatever I did due to the cut of the fabric, so I thought I'd throw in something different. 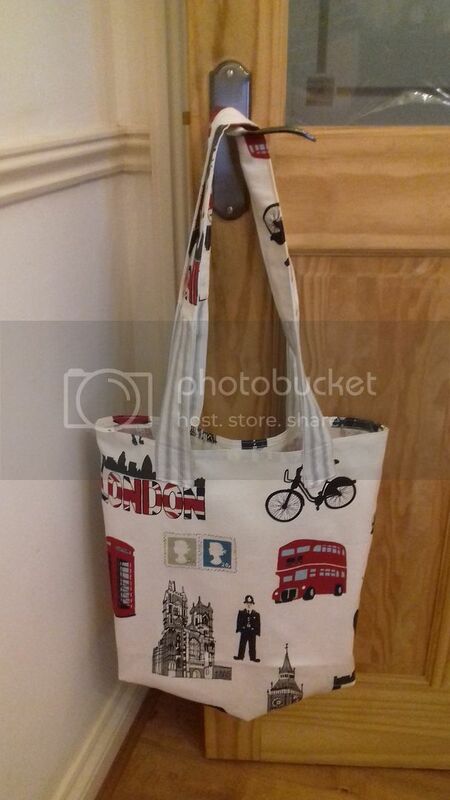 This is the most basic of basic tote bags, made without a pattern, and making up the measurements as I went along. It's 15" x 14" with a 4" gusset, gussets are a must for a shopping bag. I made that by simply boxing the corners. The handles are really long as I like to be able to put shopping bags over my shoulder as I have tiny hands! Spot the deliberate mistake? Yep, should have cut in half and sewn a bottom seam rather than using one long panel of fabric as the main piece! Yes, it saved time but the whole thing took about 30 minutes so I didn't really need to save the time! Perhaps not my neatest sewing ever! Sewing on handles neatly is soooo hard. I decided not to line it, instead I zigzaged all my seams in the seam allowance to give it a bit more strength. Clearly this is a sponsored post as I was provided the fabrics free of charge, however all opinions are 100% my own. You are right about shopping bags needing gussets - and the purchased ones so rarely have them! Lovely and interesting fabrics. 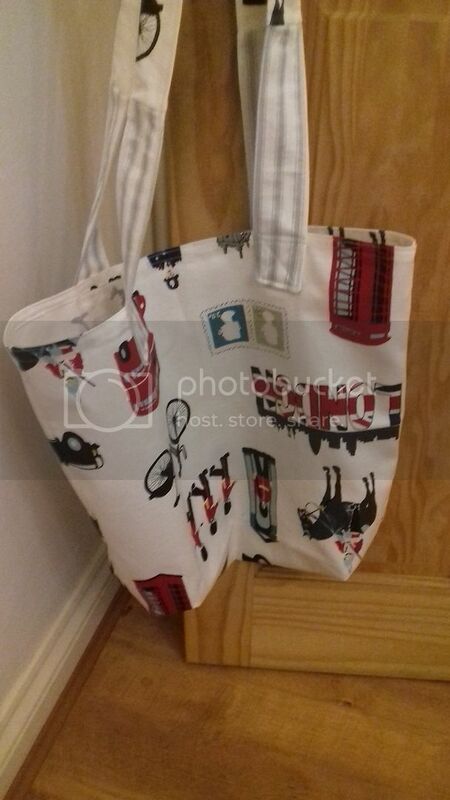 The London one was meant to be a shopping bag and if you carry it with the Upside down side against you then no one will know :). So glad you used the London fabric--when I was looking at your pile I thought "Oooo that's my favorite!" What a great selection of fabrics you were given! Love the bag you made, it's fantastic. Lots of inspiration in those lovely fabrics!